protuberancias y superficie solares – 18/11/2017 by flickr user Jordi Sesé. All rights reserved. Used by permission. 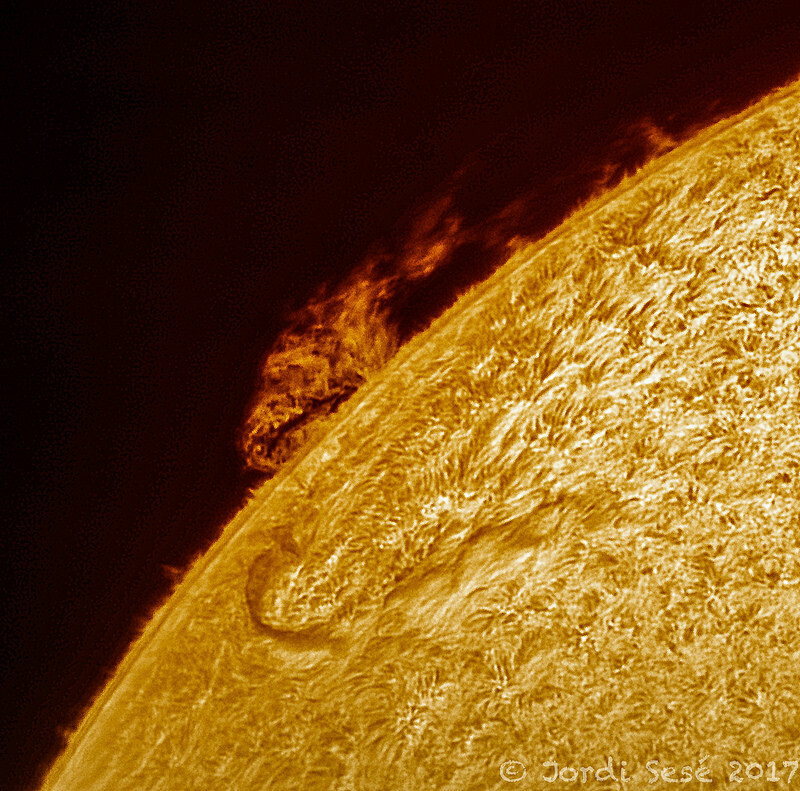 In this impressive image, a massive solar prominence erupts above the limb of the Sun. Furry spicules are visible along the entire edge of the disk. The roiling surface appearance of the Sun is caused by filaments and fibrils (prominence and spicules away from the limb — see blog text for details). All these solar features are usually invisible in ordinary white light. These phenomena are only revealed through narrow-band hydrogen-α light filters. Tele Vue 2.5x Powermate™ into ZWO ASI174MM monochrome camera using 100mm f/10 achromatic scope with modified Coronado PST Hα and BF10 blocking filter. If you’re suffering from the cold northern winter like we are at Tele Vue headquarters in upstate New York, you’ll instantly be “warmed” by these “hot” solar images made by Jordi Sesé Puértolas from his balcony in Barcelona, Spain. These photos appear to show a blazing inferno on the “surface” of the Sun. However, science tells us this is not fire we are seeing but hot plasma (ionized gas) and gas in the wavelength of Hydrogen-α light. This year all eyes will turn to the Moon to mark the 50th Anniversary of the first Moon landing. The Moon is the natural first target for new amateur astronomers, yet all too often as observers become seasoned, the Moon becomes a nuisance that blots the stars from the sky. This week we explore the Moon through the eyes and talented hands of Michel Deconinck. As you will see, there is much to see in the monthly dance between shadow and light on the lunar surface. The Crater Copernicus © Michel Deconinck. All rights reserved. Used by permission. Tele Vue 10mm Delos eyepiece (100x) with 4” f/10 Bresser refractor. 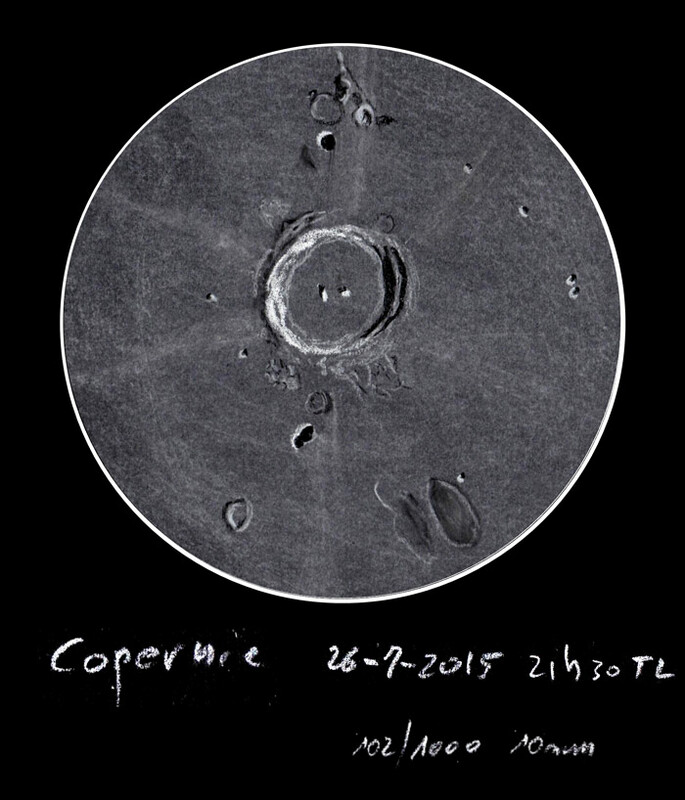 The 93 km Crater Copernicus was drawn on July 26, 2015, during a waxing gibbous Moon phase. “It is rather difficult to draw, many subtle details emerge such as the arc of small impact craters and its network of lighter lines that are visible over several hundred km. Some landslides are also visible, …”. Michel Deconinck is an artist in the South of France with a passion for astronomical watercolors. He is very involved with the international astronomical community and his artistic works have been published in magazines, scientific journals, and displayed at conferences and school events. His artistry is augmented with a background in nuclear physics, engineering and astrophysics. Tele Vue Renaissance brass telescope (built 1984-1993) was the first Nagler-Petzval type lens design to go into wide-spread production. With its solid brass tube, its classic look is timeless. 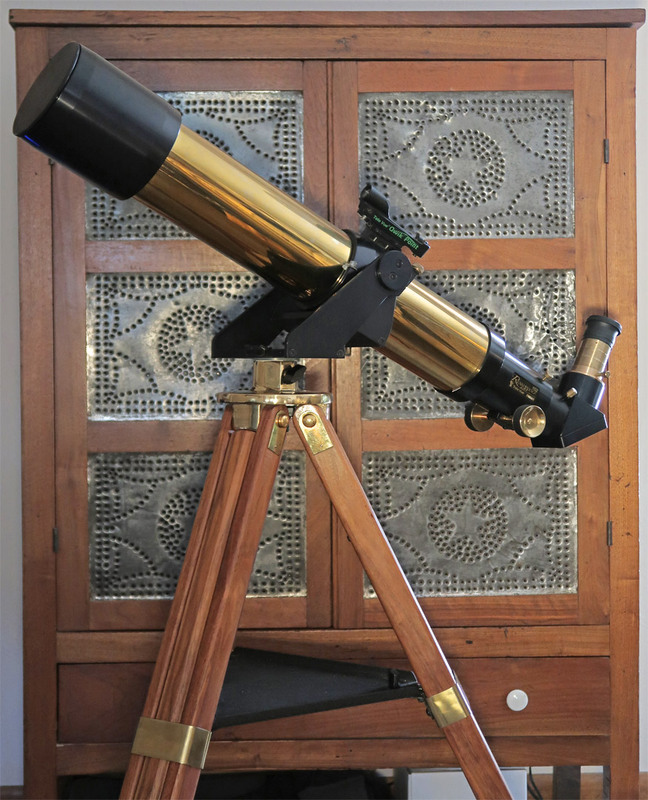 A customer recently called because his vintage Tele Vue Renaissance telescope needed some tender-loving care. 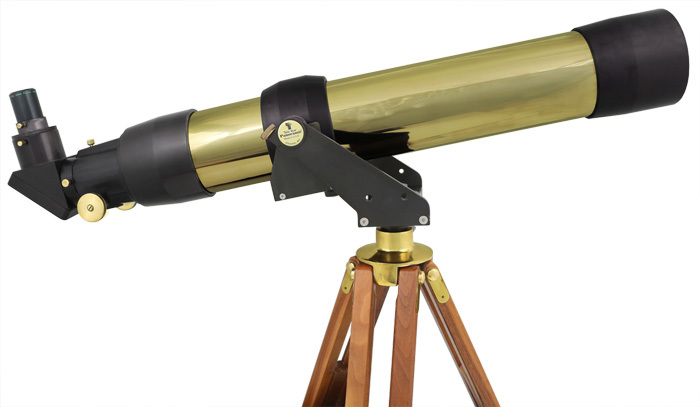 The Renaissance was our second model, put on the market after the 1981 “Multi-Purpose Telescope” (MPT). 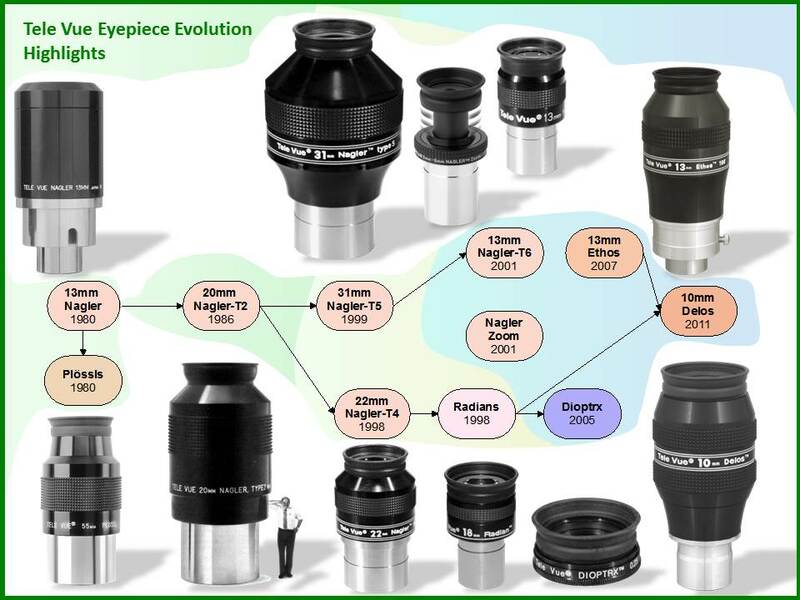 The customer’s scope was built in 1985 and is from the initial production design with a bolt-on focuser. After discussing the obvious issues that needed addressing and our evaluation process, he decided it would be worth it to him for us to have a look at the scope. When we received the scope, the most obvious troubling issue was the focuser. It was unusable. 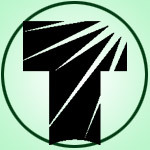 The pinion shaft was badly bent and two of the three teflon runners supporting the draw-tube along its travel were missing. The outer surface of the objective showed years of grime, and all of the brass components were heavily oxidized. The optics, however, were only slightly mis-aligned, producing a mildly flaired star shape at high power, but the image was still serviceable for terrestrial and deep sky viewing. Sadly, after a complete optical and mechanical inspection, we concluded that it just wasn’t worth the effort and expense to revive the telescope. That, however, was not our customer’s conclusion. He gave us the go-ahead and we proceeded to give his 1985, brass Tele Vue Renaissance a new lease on life. A “renaissance” for this Renaissance if you will! Left: The brass telescope tube in need of polishing. Right: tube after machine and hand polishing. Vic Bradford’s brass Renaissance 102 on matching Gibraltar mount stands in front of an antique pie safe. Images courtesy of Vic Bradford. These instructions are for cleaning and polishing brass lacking a clear-coating. Following these instructions will ruin your coating. Surfing through the AstroBin site’s collection of user generated astrophotos we were struck at this vivid example of M16 “The Eagle Nebula.” The image has a depth and contrast we’ve never seen before. Created using “Hubble Pallet” filters, the rich blue (Oxygen III) surrounding the “Pillars of Creation” structure is highlighted by the ruddy bland of reds (Sulfur) and greens (Hydrogen-alpha and Nitrogen) in the “folds” of the surrounding dust clouds. The blackness of space at the edge of the dust and gas cloud is preserved against all the colors. 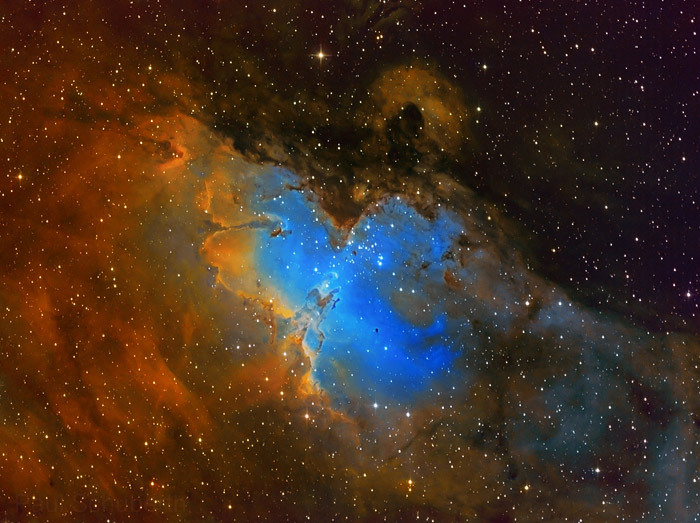 M16 Eagle Nebula – Hubble Palette by AstroBin user Paul Schuberth. Copyright Paul Schuberth, All Rights Reserved. Used by permission. Teleskop Service TS Optics 10″ f/4.65 Newtonian-Astrograph using Tele Vue BIG Paracorr 3″ and Atik 383L+ mono camera carried on Sky-Watcher EQ8 mount. Taken in the “Hubble Palette” using Baader H-alpha 7nm (10×600″), OIII 8.5nm (10×600″), and SII 8nm (10×600″) filters with a total integration time of 5-hrs. Uranus by Instagram user astrobobo. Copyright astrobobo. Used by permission. Imaged with Tele Vue 2.5x Powermate™ on Celestron EdgeHD 8″ SCT (effective focal length = 5080-mm) and ZWO ASI290MC camera. On the 23rd, the “ice giant” Uranus will be visible all night, as it rises when the sun sets (hence it is opposite the sun). It will also be at its largest for the year: a diminutive 3.73″ of arc. Due to its distance and close-to-circular orbit, Uranus doesn’t vary that much in brightness over time. It will reach magnitude 5.7 from mid-October through early November before slightly fading to magnitude 5.9 in late March 2019. 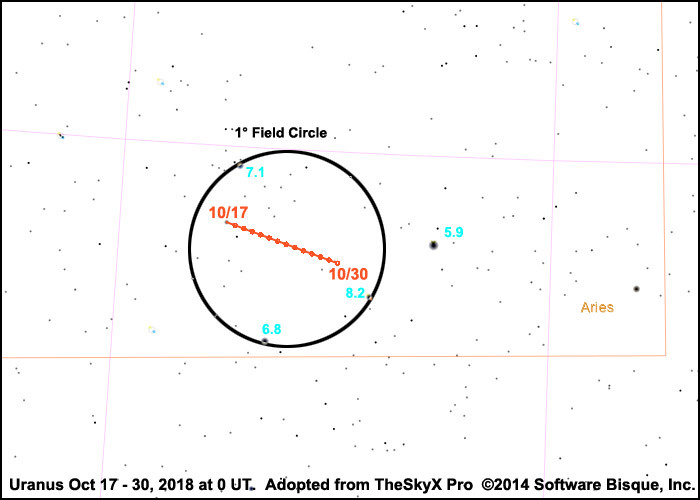 This makes it a naked-eye target in dark skies and easy to locate in a binocular or finderscope. Imaging in the Stratosphere with Tele Vue! 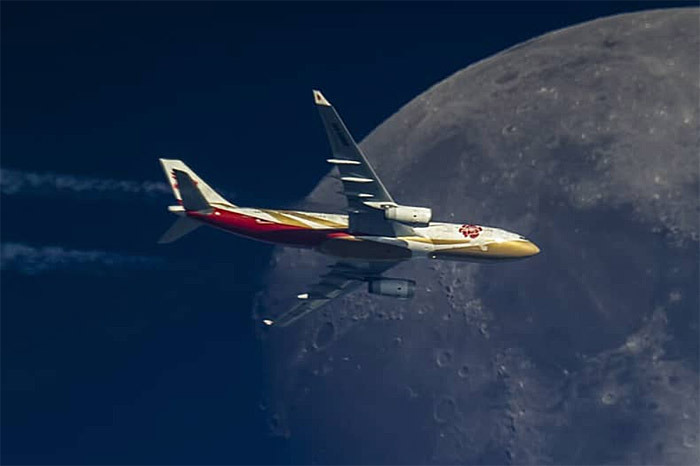 Air China A332 crossing the Moon (crop) by Instagram user Kacper Lechwar. Copright Kacper Lechwar. Used by permission. Air China Airbus A330-243 is captured poking its nose into the Sea of Serenity as it crosses the face of the Moon. Imaged using 254mm / 1200mm Dobsonian telescope with Tele Vue 2x Powermate™ and Canon 1200D / EOS Rebel T5 (18.1-megapixel) camera. Shot at cruising altitude (30,000+ feet). With this Powermate™ setup, Kacper takes a series of images in quick succession of each plane. He then reviews them on a computer before processing the best ones. Click to see full image. We’ve noticed a proliferation of close-up plane images on Instagram made using Tele Vue Powermate™ image amplifiers. What is amazing about these images? They are taken from the ground with the plane at jet-aircraft cruising altitude. This is the imaging side of the hobby of “plane spotting.” It is sort of like bird watching — but the “bird” is much bigger and potentially much further away: in the stratosphere! While imaging a bird can be serendipitous, the modern plane spotter has the advantage of free online flight-tracking software, such as FlightRadar 24 and FlightAware, to predict what aircraft are approaching their location. Aircraft identification, route, speed, altitude, and heading are just a click away. This software has also made its way to the ubiquitous smartphone. Thus, unlike birding, plane spotters can anticipate targets to observe in advance. This gives the spotter time to prepare for encounters with common and rare aircraft — like the Antonov An-225. Antonov An-225 Mriya GML-LEJ by Instagram user Krzysztof Migo. Copyright Krzysztof Migo. Used by permission. 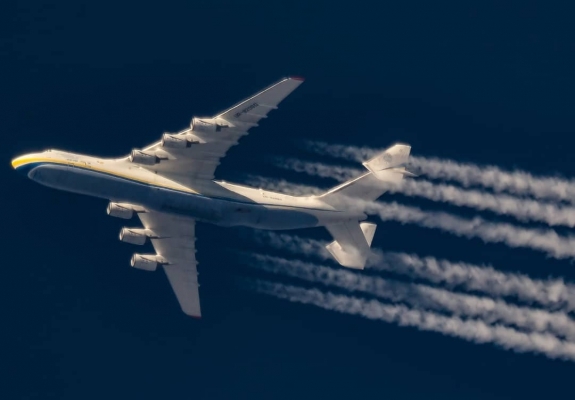 Antonov An-225 Mriya caught flying from Kiev to Leipzig. Imaged using a Skywatcher 200/1000 (f/5) scope with Tele Vue 2x Powermate™ and Canon 700D / Rebel T5i camera (18.0 megapixel) DSLR camera. . Shot at cruising altitude (30,000+ feet). From Tom’s Driveway: Tele Vue-NP127is & Tele Vue-85 Simultaneous Imaging! 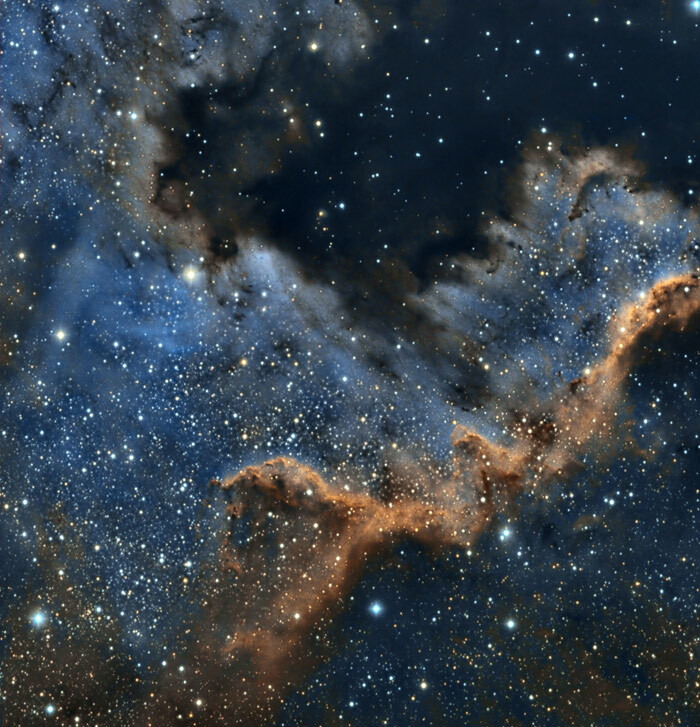 Cygnus Wall LRGBSHO (crop of NGC 7000) by Astro Bin user Tom Peter. Copyright Tom Peter. Used by permission. NP127is and TV-85 combined exposures of 22.2-hours. Click for details. We noticed some unique images on AstroBin.com employing our Tele Vue-NP127is and Tele Vue-85 scopes to simultaneously image the same target. The images from the two scopes were combined to create the final image — with fantastic results! All the image locations are given as “Tom’s Driveway” in Terre Haute, IN. Intrigued, we contacted the imager (“Astrovetteman”) to learn how he settled on this technique for many of his images. So we turn over our blog this week to astrophotographer Tom Peter and his dual-scope driveway setup.